The Barska Top Opening Biometric Fingerprint Safe has a fingerprint control with the capacity to store up to 30 users. With its pre-drilled holes, you can easily mount this safe into a shelf, the floor, or a counter top. Your valuables are guaranteed to be safe and secure, thanks to its 2 solid steel locking bolts. 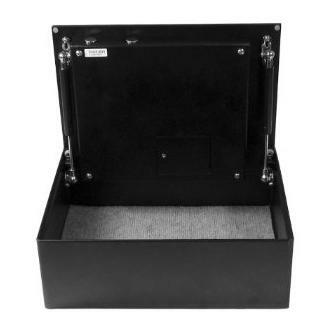 This drawer safe comes with emergency back-up keys, a protective floor mat, and mounting hardware. Made of heavy metal, this safe also has a hydraulic door system that easily opens with the touch of a finger. This product comes with a 1-year limited warranty. 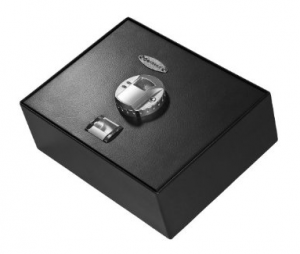 So far, the Barska Top Opening Biometric Fingerprint Safe has only had 15 customer reviews on Amazon.com. Majority of the reviews were positive, with most customers giving the product high ratings for its reliability and user-friendly features. Design flaws – One customer had complaints about the build quality of the product. According to this reviewer, the door was not mounted squarely with the body of the safe which results in the door catching on the corner when you try to close it. This customer also mentioned that the locking bolts made a squawking noise as though the bolts were rusty. However, this customer admitted that the fingerprint reader works well and the safe itself seems very sturdy. Poor customer service – The other reviewer who gave a low rating reported that they received a unit with faulty locking bolts. However, the biggest disappointment for this reviewer was the lack of response from the customer service department. No one answers the phone lines and no one returns voicemail messages. Easy to program – Customers were pleased at how easy it was to program the fingerprint reader. The manual gave clear and concise instructions. Programming fingerprints was quick and painless. Reliable fingerprint reader – Reviewers were also impressed with the fingerprint reader. According to these satisfied users, the safe opens flawlessly almost every time. While there are only a few customer reviews for this product, customer feedback looks promising so far. There are no major negative issues that were reported, although one complaint about the unresponsive customer service might be something to think about. Generally, comments about the product are highly positive, especially when it comes to its fingerprint reader. Unlike most other biometric safes, a lot of reviewers claim that the fingerprint reader on this unit always works. Programming is also relatively easy. All in all, this product sounds like a good buy.